Benefits of going rafting with a commercial outfitter include the fact that they take care of details like permits, shuttles, and food. However, boaters who have invested in their own gear and training have the option of running a private trip on the Middle Fork; with some planning and the right gear, the logistics aren’t that conmplex. 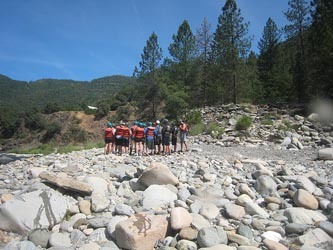 Here is information to help you plan a private Middle Fork American River trip. You don’t need a permit to do a private run on the Middle Fork of the American River, but if you camp, you will need a wilderness camping permit from State Parks. Call (916) 988-0205 for more info about this process. If you want to do a two-day river trip on the Middle Fork you’ll need a wilderness camping permit. Make sure you understand what land is available for camping–private landowners tend to be pretty irritated when people camp uninvited on their property. Camping is available on the public land between Kanaka rapid (mile 4) and Ruck-a-Chucky (mile 14). Don’t rely solely on your GPS device or Mapquest to get you to put-in, take-out, or even Foresthill. These hi-tech devices have taken many people down rugged forest service roads. Make sure to look at a map! There is no organized shuttle program on the Middle Fork of the American so you’ll have to shuttle your own vehicles. 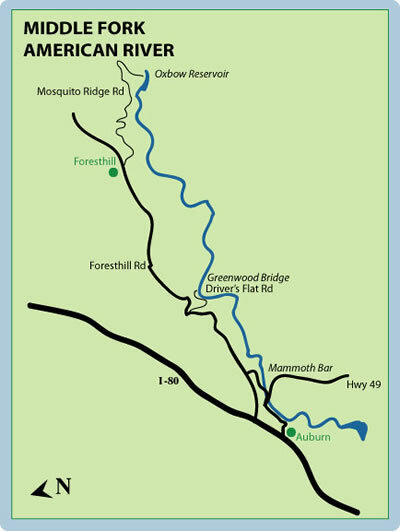 The Middle Fork American River is located near Foresthill, CA. From Sacramento, take I80 East and exit at Foresthill Road. Head south (right) on Foresthill Road for 15 miles to the town of Foresthill. The put-in for the Middle Fork is below the Oxbow powerhouse. From Foresthill you’ll take Mosquito Ridge Road. Go over the bridge (over the North Fork of the Middle Fork) and then turn right at the stop sign to continue on to the Oxbow put-in. You’ll see the gravel put-in area. Private rafters and kayakers can take out out at the Greenwood Bridge. Take the Foresthill exit off Hwy 80 in Auburn and drive across the bridge until you get to Driver’s Flat Road, about four miles down on the right. Be prepared for a bumpy ride–the pavement on Driver’s Flat gives out after the first half-mile or so.